Favorite Running Food GU gel during race; after a race--a cheeseburger! Why do you run? Running makes me feel at peace, it keeps me healthy and sane. Describe your best marathon memory. Running my first BQ at a small marathon in Utah and being so excited that even the race director was jumping for joy with me. Why do you pace? 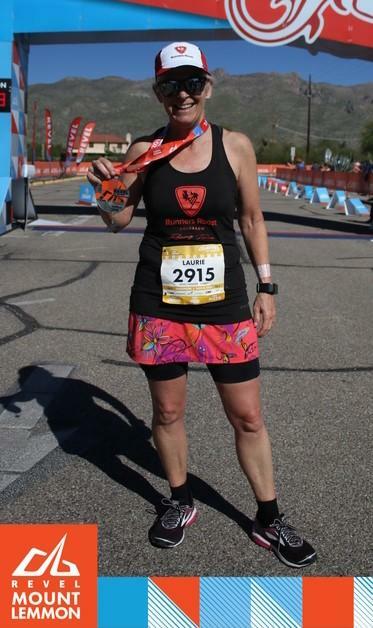 I pace to help people reach their goals, to run races in new places, and to be an ambassador for running--to show that a person can reach their goals no matter their age. Tell us your best pacing experience. I paced a young man, newly home from Afghanistan, who was running a marathon in memory of his Army buddy who was KIA. Lots of tears at that finish line! Any tips for runners about to join your group? Don’t try anything new on race day, not even new socks! Keep well-hydrated during the race. Anything else you’d like to share? I plan to run an ultra this year. What philanthropic activities do you have? Volunteer at various races in the Denver area, parish nurse at my church, have fundraised for charities.